Spring and Summer are the perfect time for salads. Salads are so refreshing and can be dressed up so many different ways that you could probably have a different salad every day this summer and have it be completely different form the day before. 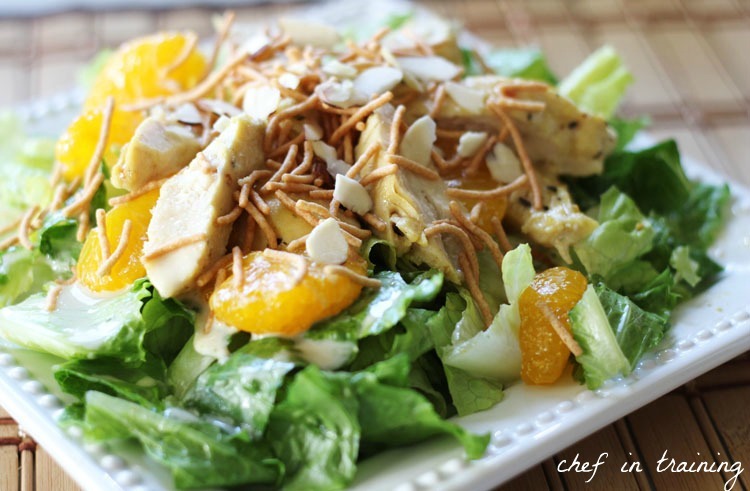 My family loves this Oriental Chicken Salad. The dressing adds an amazing flavor and the salad “accessories” add a nice crunch, refresh, and flavor as well. Start by placing chopped Romaine Lettuce on plate or in a bowl. Next top with mandarin oranges, as many to your liking. Next place the seasoned, cooked and sliced chicken. Top with chow mien noodles, almonds and Dressing. To make dressing: combine all ingredients and whisk until smooth and blended. This salad looks wonderful! I feel stupid for asking this but is there a recipe to go with it? I'm especially curious as to what is in the dressing! Thanks! Nikki, this looks incredible.. so simple and refreshing. Perfect for a light dinner or quick lunch. I love all of the flavors and textures going on! Can't wait to try this! I've seriously been looking for a recipe like this! I love chicken oriental salad! The dressing sounds wonderful. I am going to give this a try! Thanks! I made this last night and it is restaurant quality - like Cheesecake Factory. My meat and potatoes hubby loved it and took the leftovers to work. I will never buy oriental salad dressing again. This was just too perfect.